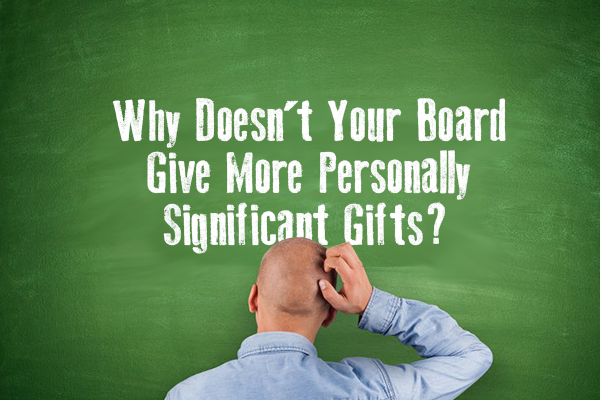 Why Doesn’t Your Board Give Personally Significant Gifts? In the course of working with fundraisers representing thousands of organizations, two things are clear. You’ll never get anywhere if this is the case. It starts with that first meet and greet. You’ve got a “hot” prospect for the board and you’re immediately thinking you’ll do anything to get this person to join. Wrong! Stop right there. It’s a privilege to serve and you only want board members who are passionate about joining. If they’re doing you and the organization a favor, it can only go south. Who would give a personally significant gift on top of doing someone a favor? Let’s assume they’re passionately interested. Make sure they know what’s expected up front. If your don’t set their sights high from the get go, you’ll have to work triply hard to raise their sights later. Perhaps you have a minimum threshold. My strong preference is to ask for a personally significant gift. So now you’ve got board members who understand they’re expected to give personally significant gifts. How do you get those gifts? You solicit your board members as you would any other major donor: individually, face-to-face, with as much peer involvement as possible. Why do so many organizations have board chairs make a pitch at a board meeting and then send around pledge cards? Or send board members home with forms to fill out on their own? Would you make a group pitch to all your other major donors? Or send them home with forms so they can decide on their own? Nope. You’d determine an ask amount, sit down face-to-face, and ask for that amount. Board members are donors too! Please don’t forget it!